I was put into music as a kid with training in classical piano into my late teens. Bach was a pretty big influence during that time; there is nothing more satisfying for an adolescent introvert than to drill some heavy contrapuntal passages until they become second nature. I was actually totally content with just interpreting other people’s music until around age 17 when the desire to articulate specific things that didn’t really exist in the standard repertoire of the Royal Conservatory of Music (the mighty overlord in Canada) began seeping into my head. I would say that my first attempt at composing was born of a somewhat unusual preoccupation with the piano music of the original heartbreaker, Frédéric Chopin. I had this kind of bizarre idea that it would sound amazing to isolate the most lachrymose harmonies or chord progressions from his various works (the Mazurka Op. 17, no. 4 in A minor is a particular favourite of mine) and build a composition comprised of only those tonal elements. When I was 20, while still living in my hometown of Calgary (in the Canadian prairie province of Alberta), I was incredibly fortunate to gain employment as a tour guide at a musical instrument museum--mostly acoustic and electronic keyboard instruments at the time. In those days, I would often arrive early before giving a tour and dedicate myself to learning a specific instrument. This served as my first introduction to the world of synthesizers (which, in conjunction with subsequent access to various other electronic instrument collections, has regrettably turned me into the sorry snob you see today) while also affording me the ability to experiment with uncommon acoustic instruments such as harpsichords and organs. I always enjoyed sitting at this one large reed organ and just listening to the sort of shimmering overtones that would emerge while holding down an octave or fifth or something on the manuals and pedals; there was something really comforting and uncomplicated about the experience. I soon found the same simple joy in setting two oscillators on an analog synthesizer in tune and listening to them endlessly drift in and out of one another. By that time I had been exposed to a modest range of experimental music that incorporates extended textures, but it wasn’t until I reached grad school at Mills College a year or two later that I realized it was actually “okay” to exploit such an experience as a compositional tool. Really, the most influential composer on my current practice has been La Monte Young. I had heard excerpts of The Well-Tuned Piano and knew of his Fluxus compositions, but it was hearing The Second Dream of the High-Tension Line Stepdown Transformer on the very first day of school while walking into a composition seminar that really just broke me. I had never heard music that was this sparse and patient and so unbelievably rewarding in its demand for total immersion. I think LMY has taught a lot of composers that it’s both beautiful and necessary to be slow, deliberate, and honest. Other influences in this regard specifically include les hommes extraordinaire, James Tenney and Alvin Curran. I tried a lot of things early on: writing cutesy Tiersen-style bits for piano, sussing out backing synth textures from New Order songs or whatever on a Jupiter 8, straight up ripping off some Lutosławski harmonies for school assignments, even messing around with a guitar once or twice to get some mangled Niandra-era Frusciante passages. I think that by emulating what you know you can gain better insight into how a physical action or theoretical approach corresponds with a familiar sound and, following that, you can then manipulate or extend the effect to suit your own sonic desires. 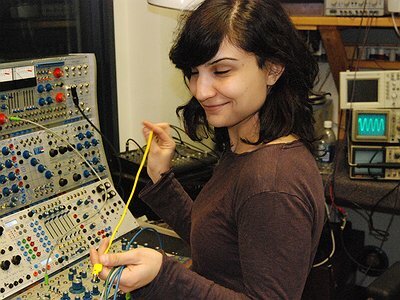 When I first started working with synthesizers I didn’t know about Éliane Radigue or Laurie Spiegel or JD Emmanuel et al, and I felt little connection to the earliest electronic music that grew out of post-war serialist practices. I guess I initially turned to these wonderfully unstable analog machines because I wanted the rich spectral qualities of certain acoustic instruments but didn’t know how to deal with the physical limitations. I still sort of feel like I don’t really use electronic instruments in the same way as most other people who have also entered that world in the past decade, so I suppose that’s something that helped offer a way forward early on. Compositionally, it was trying to reconcile my interests with years of basic Western theory telling me that I wasn’t “allowed” to do certain things. I don’t mean to suggest that that early training hasn’t been useful; on the contrary, it has been invaluable, and I think any sort of knowledge or experience you can gain about anything is good. But I had to actively undo a lot of the rigor in order to be able to come back to it and pick and choose what I want or need. It definitely took some time for me to really get comfortable with the idea of presenting super bare textures that take something of a long time to shift, and, even then, often only subtly. I still struggle with it in live contexts occasionally, aware of when people seem to be turning restless. I don’t concede to it and I get off on the experience of making those progressions happen in real time, but it’s sometimes hard to ignore. I really don’t mean to pick on my training but I would also say that there was a bit of buried trauma leftover from what tends to be an anxiety-ridden approach to performance in the classical world. After I gave up piano, I had no interest in performing live music until just a few years ago, despite finding great merit in the experience of how certain sounds can resonate differently in various physical spaces. Since discovering that live performance doesn’t have to be like that and that it can actually be quite pleasurable, I’ve been able to cope much better. Of course, when I decided that I wanted to start performing again, I was stuck with a bunch of fixed, studio-based compositions that were so heavily processed and multi-tracked that it was logistically impossible to recreate anything live. So, after I finished grad school I spent a glorious five weeks in residence at The Banff Centre sorting out a method for transcribing my studio approach into a live setting. I’m not terribly fond of the performer-on-stage-with-audience-watching set up, and, to the extent that I’m able, I like to keep the space quite informal with few visual distractions so as to allow the listener to really focus on the sound itself. I work mostly from home, though I’ve never really had a proper studio set up. You don’t need it if you’re working exclusively with electronics and I’ve moved around a bunch in the past six or so years, so I make do with my computer and a small interface. I have a modest collection of electronic and acoustic instruments, most of which sit at arm’s length at home in Vancouver, some of which sit in boxes and closets here and there, and some of which rather permanently live under blankets in my parents’ basement in Calgary. When I record with acoustic instruments, I’m actually not terribly picky about the space. Of course, it either has to be very quiet or the background hum has to be pleasant enough and the microphones have got to be in top form, but I don’t really mind the idea of recording in whatever room happens to present itself and I think it can be interesting when you’re juxtaposing different spaces within a single work. I certainly think that the weight or feel of a place is important, but I can’t think of many that I’d discount just because something felt off—I am, in most cases, a believer in giving second chances. I’m really looking forward to recording in a bona fide studio with an engineer this year; I’ve never done that before. It might sound odd, but I’ve always found the relative cleanliness associated with most aspects of music production and its corresponding spaces and objects to be extremely appealing. With regard to electronics, I rely pretty heavily these days on my EMS Synthi AKS and Sequential Circuits, Inc. Pro One. The latter I use especially often for live performances; the Synthi was designed to be portable but it’s just so old and temperamental and valuable so I only bring it out for special occasions. When I’m recording, it just kind of depends on what’s available and there’s absolutely no shortage of machines to experiment with if you’re willing to dig. I have a lot of one-off favourites, but I suppose the ones I hold most dear are those 1970s offerings from Buchla, EMS, and Sequential. I definitely think that synthesizers, like acoustic instruments, have clear limitations and a unique personality and that’s a huge part of what makes them interesting; I know more or less what they can and can’t do, and there’s still so much ground to cover within that range, so I don’t feel like I’ve exhausted anything in that world, even with instruments that I’ve been using for years. With regard to acoustics, I always come back to orchestral string instruments. For recording purposes I like to work with the mid and lower end of cello and viola, but in live contexts I sometimes incorporate processed violin, which I play very poorly. In the past, I’ve incorporated a lot of reed organ and woodwinds--mostly flute because it’s the only one I can play, sort of. In my recent acoustic work I’m trying to branch out a bit: right now I’m working on a choral piece and another for bowed piano. I’m pretty reliant on Logic/Pro Tools as a compositional tool; especially for fixed pieces, it’s kind of where everything comes together. It certainly allows for me to be more flexible than I would otherwise be capable. With acoustic pieces, for instance, I can layer any combination or any number of instruments that wouldn’t really be feasible or reasonable in a live setting. I don’t see any way in which the technology hinders things for me since I still feel satisfied, albeit in a different way, with what I do in contexts in which I’m not using it. But to be honest I’m not sure I’ve thought about the potential negative aspect of it all that much. "I’ve always found the relative cleanliness associated with most aspects of music production and its corresponding spaces and objects to be extremely appealing."